National Artist for Visual Arts Benedicto “BenCab” Cabrerais celebrating his 50th year as one of the country’s most renowned artists. As part of the brand’s movement to support the arts, Samsung recently opened an interactive exhibit at the Yuchengco Museum to celebrate the National Artist’s creative milestone. To coincide with the event, Samsung also unveiled the Galaxy Note5 BenCab Limited Edition, of which only 1,000 units will be made available in the market. “BenCab in Two Movements” captures the National Artist’s transformational, collaborative spirit and his great willingness to push his craft to the next frontier. The one-of-a-kind exhibit captures how art and technology are intertwined. The show allows visitors to Yuchengco Museum to dance along to BenCab’s collaborator, Polish choreographer PaulinaWycichowska, whose movements are captured in 40 sketches in the 2006work Studies of Dance Movements. The exhibit uses customized Samsung Smart TV and mobile apps to enhance the visitors’ interactive experience. Samsung also unveiled the Galaxy Note5 BenCab Limited Edition—a fine marriage between art and technology. Only 1,000 units will be made available in the market. 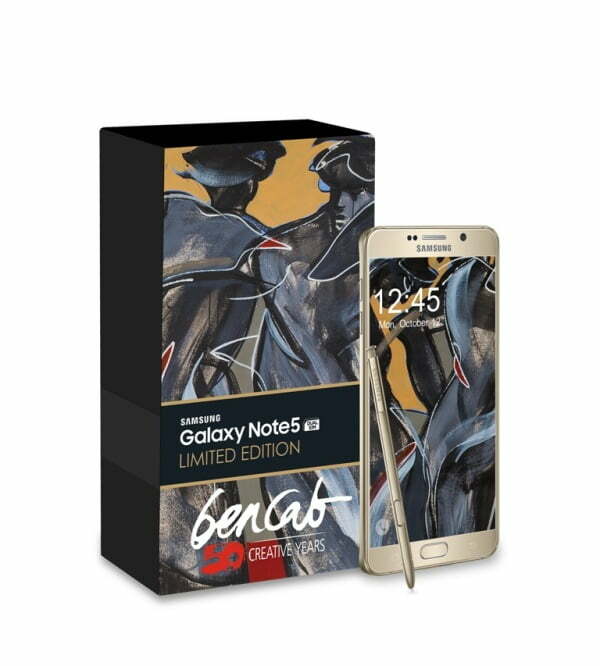 The limited-edition phablet comes in the Gold Platinum Galaxy Note5 variant with three pre-loaded Samsung art applications, exclusive BenCab artwork wallpapers, a commemorative BenCab in Two Movementsmicro art book, a special protective case featuring BenCab’s 2007 work Dance Interpretation, a certificate of authenticity, and unique serial number engraving at the back of the device. The launch of the limited-edition Galaxy Note5 captures BenCab’s belief that technology can bring the arts and culture closer to the hearts and minds of Filipinos, a cause embraced by Samsung. “As an artist, I have always dreamt of one day putting up a museum that would show not only my own work, but Philippine tribal art and contemporary works as well. In the end, all that you leave behind is your work, and I believe that the museum will be my legacy, and also my little contribution to the environment. I also recognize that this legacy would be far more meaningful if it can also be experienced, not just seen. So making my work interactive to the audience is like bringing these museums into people’s lives; with the case of the Galaxy Note5, bringing it to them via their smartphones. It is also one way of making the arts more immersive for people who are used to multimedia,” says the National Artist. His choice of a device on which to showcase his works also reflects his appreciation of how technology can enhance art. The Galaxy Note5 offers a large 5.7” Quad HD Super AMOLED display, making it the optimal device on which to view his various works. It also comes with the powerfully-enhanced S-Pen that revolutionizes the digital handwriting & drawing experience on mobile devices, and a professional grade 16MP camera, among others. BenCab’s artistic spirit takes flight with this initiative by Samsung Electronics Philippines, which articulates the technology leader’s commitment to the promotion of artistic expression and cultural development. By leveraging its strengths in technology, Samsung provides an ecosystem for digital art creation and presentation—something that BenCab hopes to fully explore in the future. Log on to ZALORA (zlrph.com/samsung-bencab) or go to the select Samsung Experience Store to purchase the stunningGalaxy Note5 BenCab Limited Editionsmartphone. Visit www.nextisnow.ph for more details. Samsung Electronics Co., Ltd. inspires the world and shapes the future with transformative ideas and technologies, redefining the worlds of TVs, smartphones, wearable devices, tablets, cameras, digital appliances, printers, medical equipment, network systems, and semiconductor and LED solutions. We are also leading in the Internet of Things space through, among others, our Smart Home and Digital Health initiatives. We employ 319,000 people across 84 countries with annual sales of US 196 billion. To discover more, please visit our official website at www.samsung.com and our official blog at global.samsungtomorrow.com.